The city’s outdoor warning siren system is tested at 1pm the second Tuesday of every month, March through November, with a one-minute wail. That means we’re just over two weeks from the first siren test, which will occur on March 10. 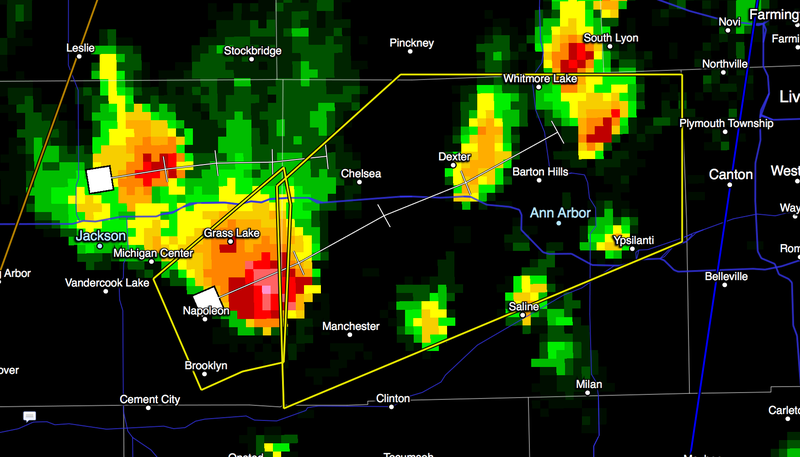 NWS Detroit has issued a severe thunderstorm warning for most of Washtenaw County until 5:45pm. This warning is in the path of a storm which developed south of Jackson and is tracking northeast at 28 mph. Hazards from this storm include 60mph wind gusts and quarter-sized hail. The storm is expected to be near Barton Hills/Ann Arbor at 5:20pm. I will monitor this storm; as we saw earlier, storms today have been dissipating more quickly owing to the relatively cool temperatures, so this storm may no longer be severe by the times it reaches us. LAKE...AND MOVING EAST AT 25 MPH. MANCHESTER AROUND 440 PM EDT. PLEASANT LAKE AND CHELSEA AROUND 450 PM EDT. DEXTER AND HUDSON MILLS METROPARK AROUND 505 PM EDT. DELHI MILLS AROUND 515 PM EDT. BARTON HILLS AND ANN ARBOR AROUND 520 PM EDT. DIXBORO AND YPSILANTI AROUND 530 PM EDT. Excessive Heat Watch – Issued when the Heat Index (HI) may be at least 105° within the next 2 to 3 days. Heat Advisory – Issued when the HI is expected to be at least 100° for 3 hours or more. Can be issued with lower criteria with successive days heat. Excessive Heat Warning – Issued when the HI is expected to be at least 105° for 3 hours or more. Can be issued with lower criteria with successive days heat. Source: Heat Awareness Day 2012 information, which also includes some other useful heat-related information.